Forgetfulone: An Award and A Swap! 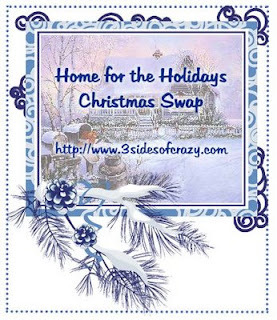 Tamy at 3 Sides of Crazy is hosting a holiday swap. Click on the link to go to her post about it. It's going to be fun! 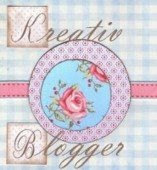 Tamy also sent me this adorable Kreativ Blogger award. Isn't it pretty? Mention the blog that gave it to you and comment on their blog to let them know you have posted your award. Share 6 values that are important to you and 6 things you do not support~ Grant the prize to 6 people. 2. Having children involved in activities that teach them teamwork, the importance of effort, and clean, healthy living and promote self-respect and respect for others. 3. The value of education, particularly in our society. 4. The value of hard work. The world owes you nothing. 5. Eating family meals together as often as possible. 1. Welfare under our current laws. They system is necessary, but needs to be revamped. 3. Boards of education made up of non-educators who think they can make educated decisions when they haven't been in a classroom since they graduated. Thanx for the award! I'll post it tomorrow - for now, I'm headed to BED! Congratulations on the award, you deserve it. LOL so serious until I got to the no underwear and I'm LMAO. Thanks for the shout out about the swap. IM with Bubba does under the jammies count? That underwear thing was hilarious. Thank you! I've posted mine and tagged six more people. I still have a meme you tagged me for that I need to post, too. That tag is cute, congratulations. Congrats on your reward you deserve it. I was just reading about the holiday swap and I think I may join in on the fun. I need to start doing things to get back into that holiday spirit, it's been hard. Thanks for the award! And congrats to you! I support the IRS around Feb/March when I get my return. I don't support them each paycheck when I see how much they take out. I hate being taxed to death. Yick. Great award and very cool meme which i very much agree with.